A variety of resources are available to help volunteer water monitoring program coordinators plan and implement successful programs on this site. These include the Guide for Growing Programs, information about relevant research, links to useful publications related to volunteer monitoring, job opportunities, and archived volunteer monitoring listserv discussions. EPA’s Volunteer Water Monitoring. This listserv has over 700 members who are interested in (and often who are practitioners of) volunteer water monitoring. The list is open to all. Members represent states and federal agencies, non-profits, colleges and universities, K-12 schools, and individuals. Click here to subscribe to the list. The Extension Volunteer Monitoring Network. This listserv has over 400 members, the majority of whom are connected to volunteer water monitoring through University Extension programs. Click here to subscribe to the list. The Citizen Science Association. This very active listserv includes thousands of members across many fields of citizen science with representation from around the world. Click here to subscribe to the list. The Federal Community of Practice on Crowdsourcing and Citizen Science. This list is available for anyone with .gov or .mail email addresses. Join by emailing the list at: listserv@listserv.gsa.gov. The NOAA Citizen Science Community of Practice. This network is for citizen science professionals from across NOAA programs. Email John McLaughlin to learn more and to join. The National Water Quality Monitoring Council. The Council offers a semi-annual National Monitoring Conference that includes numerous sessions focused on volunteer water monitoring. It is the premiere conference for volunteer water monitoring practitioners. The Council includes a volunteer monitoring working group and Council volunteer monitoring representative. Danielle Donkersloot is the current rep and Julie Vastine is the alternate. Both are able to be a voice for the volunteer monitoring community with the Council, and practitioners are encouraged to contact them with needs or concerns. Danielle and Julie also sponsor semi-regular conference calls for practitioners interested in helping to facilitate volunteer monitoring events at the conference and for building networking opportunities on a regular basis over time. Finally, the Council maintains a website with the most up to date volunteer monitoring directory of programs and other resources relevant to practitioners. The Citizen Science Association. This Association is currently free to join and has over 4000 members from around the world. It sponsors a semi-annual conference (luckily, in alternate years from the NWQMC’s National Monitoring conference), and aims to provide support to practitioners, researchers and others to develop and implement citizen science initiatives of all types. Federal Crowdsourcing and Citizen Science Toolkit. 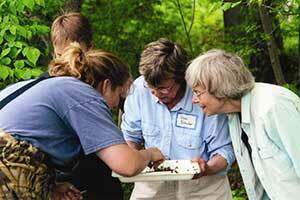 This toolkit is designed to help federal partners initiate and grow citizen science programs. It includes step by step guidance, resources, and case studies. Scistarter.com. This website lists all types of citizen science projects. In 2016, the site underwent major redevelopment and a special portal was developed for volunteer water monitoring programs to be easily listed. EPA Volunteer Monitoring. EPA led the charge to develop volunteer water monitoring programs. Their current website contains methods manuals for volunteer stream, lake, and estuary monitoring, as well as guidance on developing quality assurance project plans. The Secchi Dip-In. This NALMS sponsored program seeks to engage individuals who monitor lakes, reservoirs, estuaries, rivers, or streams to take a transparency measurement on one day during the month of July. Transparency values are used to assess the clarity across the United States and Canada. We have developed a Twitter handle to share resources, announcements, and cool stuff relevant to the field of volunteer water monitoring. Follow us at @volmonitor!